What Is Pay-Per-Click or PPC Advertising? If you haven’t already familiarised yourself with PPC advertising, you’ve come to the right place! PPC is the acronym for pay-per-click, it is a way in which advertisers pay each time one of their ads are clicked. Essentially, PPC it is a way to get targeted traffic to your website by bidding against competitors targeting the same keywords or consumer profile as you. For optimum results, it is always best practice to incorporate SEO into your PPC campaigns. Search engine advertising is one of the most popular forms of PPC. It allows you to bid for ad placement in a search engine’s sponsored links area when someone searches for a keyword that you are targeting that is related to your advert. 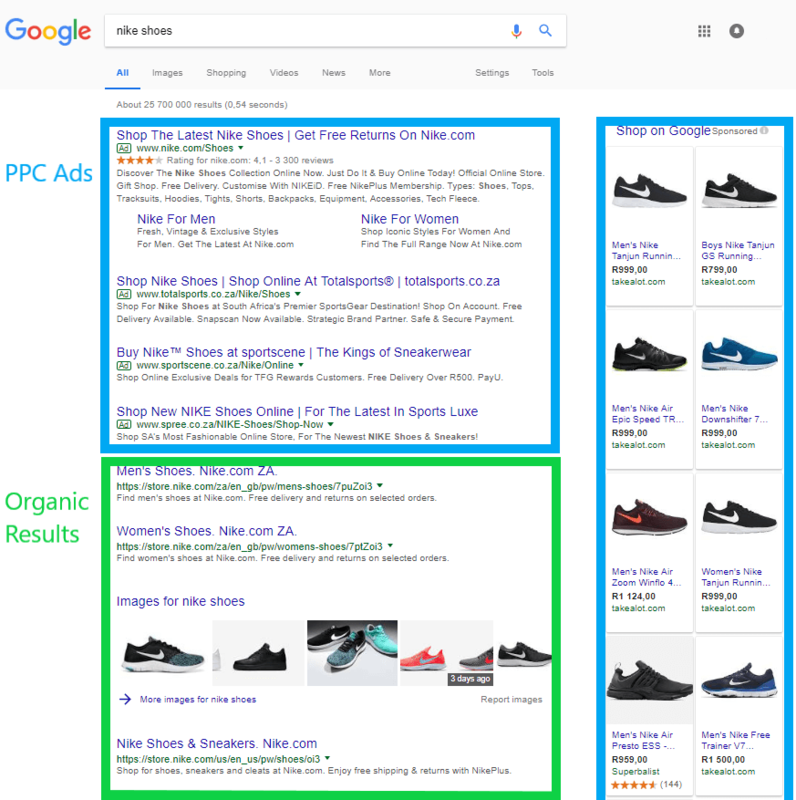 For example: If you search for “Nike Shoes,” you will see a whole bunch of competitors bidding against each other for high/visible ad placements in Google’s results page. Ad placements can get highly competitive depending on the group of keywords you are targeting. I offer an experience driven approach to maximise your search engine advertising ROI..
Google AdWords is by far the most popular PPC advertising system in South Africa. This is what I specialise in and it’s the tool that will bring your business leads/sales in the short term. AdWords allows us to create ads for your business. Google AdWords primarily works on a pay-per-click basis where we bid on a group of keywords (ad group) and when an ad is clicked, our bid gets deducted. Every time a search is performed on Google, Google digs into the pool of advertisers and chooses a set of ads to appear in the ad spaces (sponsored links area) on that specific search terms results page. The selected ads are chosen based on a few factors, namely the quality and relevance of the keywords relative to the ad campaigns and obviously the keyword bid amount. To take it a bit further, the ads that get selected to appear on search results page is based on the advertiser’s Ad Rank. Read more on Ad Rank. Google Adwords allows winning advertisers to reach potential customers at a cost that fits their budget. It’s essentially an auction to reach a targeted audience online. Get your name out there, your competitors probably have already! As you can see, the chances are very high that you will gain a click if you have a top Google ad placement and a high organic listing. With PPC, you also have alot of control over how you would like your ad to appear. It is important to have compelling call-to-actions, if your business has a slogan, great. we will incorporate that into your first AdWords branding campaign. PPC marketing is an effective short term solution. To succeed in the digital space in the long run, SEO is needed. Here’s someone who agrees that SEO and PPC are equally important.